World renowned sculptor, Lucifer Marsh, has spent a lifetime making masterpieces out of stone but, one night at his gallery, Marsh stumbles across what he feels will become his greatest achievement: the beautiful Jane. Marsh talks the gorgeous gal into posing for him and, while she's not paying attention slips her a special mickey designed to transform her lovely bones into stone. The process complete, Marsh stands back to admire his "work," when Jane's boyfriend busts down the door, demanding to know where his girlfriend is. A fistfight breaks out and the vat of Marsh's special stone-juice spills on both the men. They quickly become statues but the crazed Lucifer Marsh looks on the bright side of things: he is his own last masterpiece. 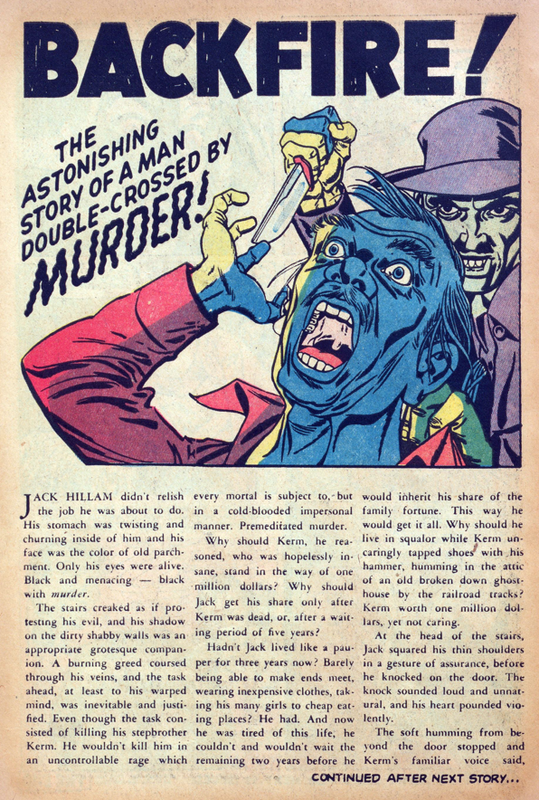 Another of the standard 1950s horror plots was the crazed sculptor/wax museum owner and Lucifer Marsh holds his own with the best of them. Even more evil than turning his subjects into stone is the fact that the victims don't die (well, I assume they do eventually, but we aren't given a time frame) and that's particularly nasty since poor Jane is an innocent as is her white knight, the doomed Henry. 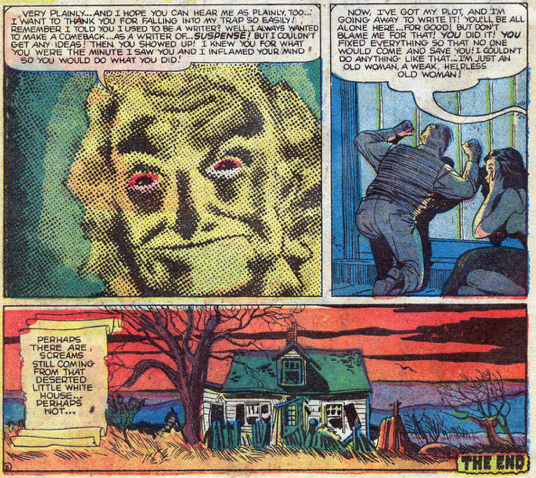 The final panel, of Marsh complaining that the formula prevents him from smiling while his face turns to stone is darkly humorous. Paul Reinman continues up my chart of Favorite Atlas artists; he's simple but effective without the typical cheats and shortcuts. When scientists discover that the military on Jupiter is sending a robot to conquer Mars, powers-that-be on Earth decide we have to build a robot capable of conquering Mars first! To that end, the big brains select Anthony Rogers as the perfect specimen of manhood, the only human being powerful enough to concentrate on rocketing the robot to Mars. The two robots met and duke it out but Rogers is just too powerful for the puny Jupterian and Earth claims Mars. But Rogers doesn't stop there. He sends his juggernaut to Jupiter to destroy all life and, with his final order, then return to Earth to do the same. Why? 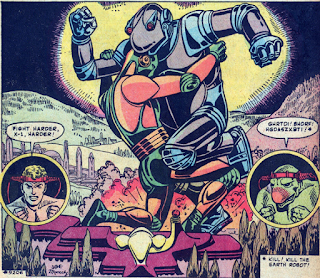 Because Anthony Rogers isn't human, he's a peace-loving Martian! Lovely Maneely art propels "When a Planet Dies!," a decent space opera script with a clever twist in its tail. 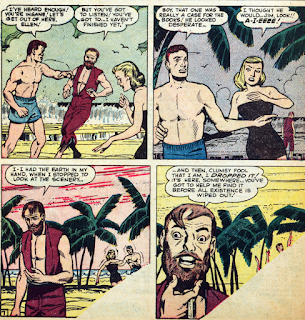 Not so clever is "No Return!," which wastes the vast talents of Russ Heath on a silly time travel story about an industrialist who muscles his way onto a time machine (it's amazing that the scientists in these tales always set the way-forward lever on 3951, exactly 2000 years into the-then future) and then finds himself stranded in a utopia that has no need for money. We're not even told how the greedy guy found out about the time machine! Jack Buckley buys a gorgeous mirror in a shop and gets it home to discover a flaw: the glass does not reflect but, instead, shows the way down a tunnel to the underground world of Stygia. Jack takes the mirror back to the shop owner, who shows an interest in tracking down the tunnel, and the two go on an adventure. Jack and Marla find the tunnel but, halfway to Stygia, Marla pulls a gun and discloses her true nature. The pair meet up with the citizens of Stygia and their leader explains to Jack that they lure humans down to test on them from time to time and then release them back to the surface to sell mirrors to unwary consumers. 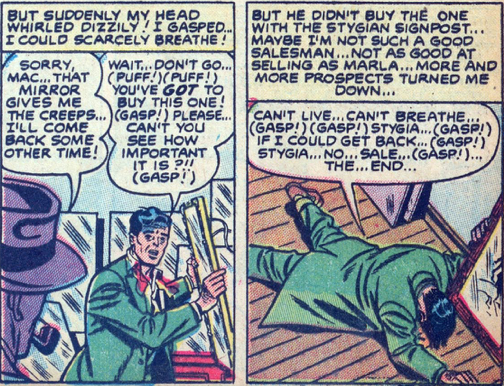 He further explains that Jack will now only be able to breathe surface air for a short period of time and that he must sell his quota of mirrors to regain entry to Stygia. And Jack is a lousy salesman. "The World Beyond" features a fanciful hook, but one that draws the interest of the reader and wraps up with a dark and satisfying climax. Not so satisfying is Al Hartley's art, which is sketchy and crude, appearing almost unfinished in spots. Hartley's number one claim to fame was his work on the long-running teenage girl title, Patsy and Hedy, for Atlas/Marvel. Carston Fuller is deathly afraid of water and when a storm lashes his remote cabin, that fear escalates to terror. Somehow, a single drop of water leaks from the roof and grows larger before Carston; soon he's engulfed by the water and imagines a world of mermaids. The gorgeous fish-girls tell Carston he can remain with them but first he must write out a list of the reasons he hates water. He agrees, and the next morning, his body is found by the local police, drowned by the leaking rain from his roof. A nonsensical fantasy that only takes up four pages but somehow seems to be ten times that size. 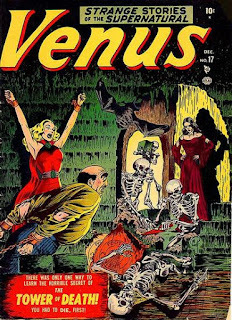 Much better (but beyond my purview) are the Venus stories this issue, wherein the gorgeous goddess must tackle the terrors of "The Tower of Death" and quash the attack of "The Stone Man." 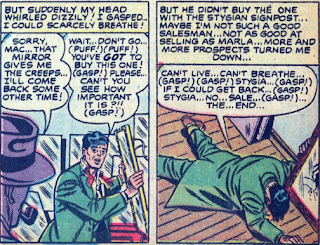 As usual, the anything-goes scripts and superb Everett art combine for a boatload of fun. A man drives through a driving rain down "The Dark Road," when, out of nowhere, he sees a figure to the side of the road, hitchhiking. Figuring it's not fit for a dog outside in this weather, he pulls over and lets the stranger in. 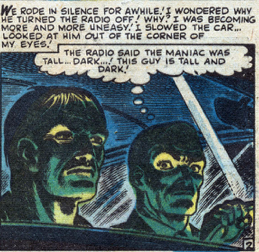 Just as they pull away, the radio announces that an inmate at a local asylum has escaped and the driver eyes the stranger warily. He makes an excuse to stop, his passenger gets out to wipe off the headlights, and the driver runs him down. The tire blows out and another driver comes along, asking about the body on the ground. Our protagonist, hearing another bulletin, this time conforming that the maniac is behind the wheel of a stolen car, fears that this may be the killer looney and crushes his skull with a tire iron. He flees to a nearby diner, where he meets up with a pretty girl. As he's using the phone, he sees a reflection of the woman grabbing a long knife and heading for him. He grabs a cleaver and is about to carve up some lunch meat when he's shot dead by two cops, who tell the woman the man dying in front of them is the escaped lunatic. 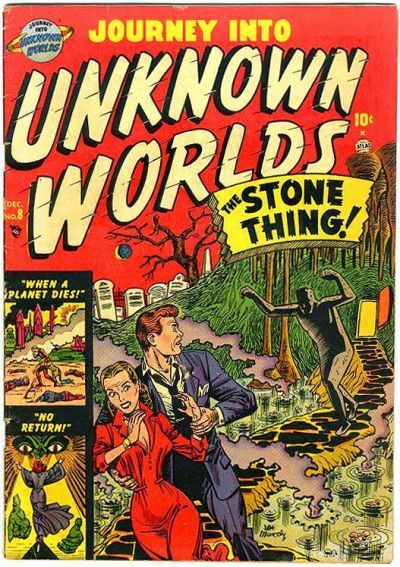 Though this plot line is as old as Moses, the uncredited writer (probably Stan) delivers a couple of clever twists to throw us off guard and keep us guessing up to (what turns out to be) the predictable outcome. I assumed from the get-go that it was the driver who was the madman, as that twist has been done to death, but the escalating violence gave me hope that we were in for something new. 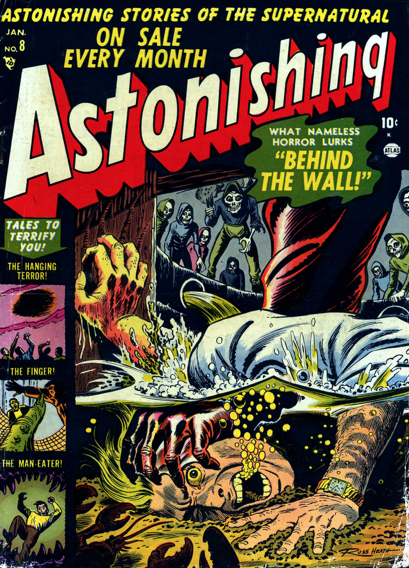 Alas... Oddly enough, Al Feldstein will write almost the exact same story ("The Escaped Maniac!") and it will see print a mere one month after this issue of Suspense, in Crime SuspenStories #8. How about that for coincidence? 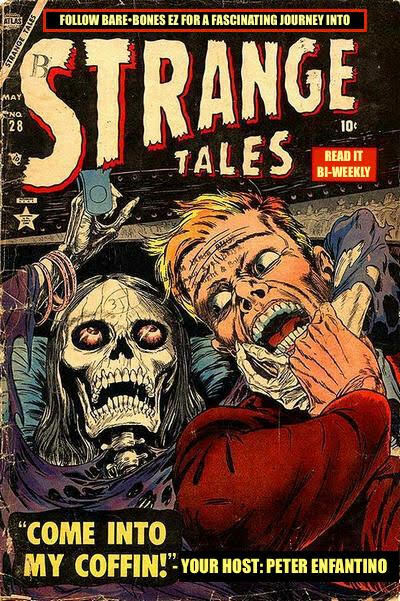 Russ Heath does a marvelous job accentuating the driver's fear (Heath loved those beads of sweat, didn't he? ), an effective way of confounding our expectations. 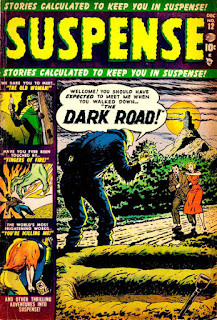 That hitch-hiker looks almost like a zombie; surely he's a homicidal maniac! "The Trumpet" is a silly two-pager about Gabriel having his horn stolen while on a train. If it wasn't signed Joe Maneely, I'd have a hard time believing this was his work. It looks more like a rushed Don Heck to me. 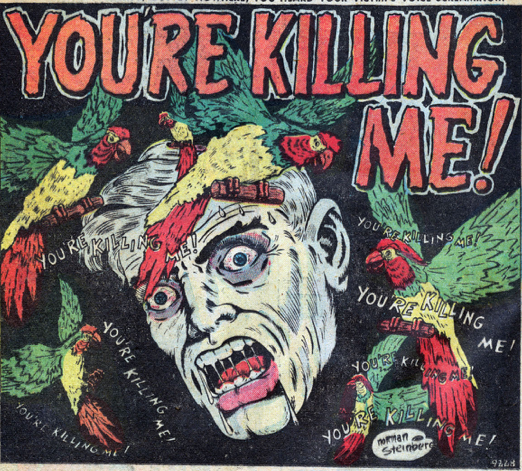 Equally inane is "You're Killing Me!," about a guy who murders his uncle for money and then must contend with the parrot who witnessed the killing. Not much can be done with three pages but artist Norman Steinberg gives it a go, delivering a nasty and effective splash. Fred is a 60-buck-a-week artist at a New York ad agency when the boss rejects a drawing Fred did and gives him a gift, a new pencil that somehow has a magical, but deadly, gift. When Fred draws a picture and then uses the pencil to erase part of the drawing, disaster follows. It works with a bridge, a jet, the horses, anything Fred puts his nib to. Lots of dough follows and that's great because Fred is in love with the office secretary, Lil, who is in love with the green stuff. Fred shows off the fruits of his "labor" and Lil shuts down her boyfriend to marry Fred, but before it can happen, disaster falls when Fred accidentally erases a drawing of himself. 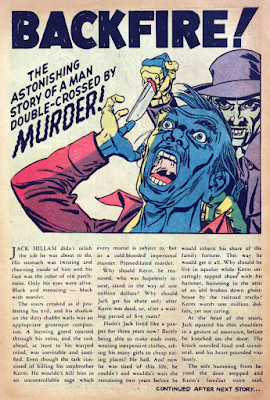 "Draw Me a Picture" is another Atlas story that resembles an EC story, one that wouldn't be published for another two years: "Easel Kill Ya" (from Vault of Horror #31). I doubt if writer Johnny Craig got his inspiration for "Easel..." from "Draw Me a Picture," but even if he did, he batted that one out of the park and "Draw Me..." barely gets to first base thanks to its lifeless art and snail's-pace script. One hilarious scene which makes it almost worth the read is when Fred stumbles on horse racing to win a bundle. How would he go about that, you ask. Fred stands next to the track and sketches each horse he wants to stumble as they're running by. This guy can not only draw faster than anyone on the planet but he can make each sketch unique in its own way! Heartless businessman James Evans is in a nasty train crash and appears dead but it's only his body that's comatose. His brain is still working and he works feverishly to send off some signal to his "rescuers" to let them know he's still alive. At the funeral parlor, his associate is called in to identify Evans and one of the attendants excitedly points to what appears to be a tear on Evans' face. 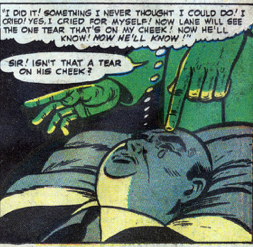 "Impossible," the associate sighs, "Evans was a man who could never cry!" Into the cremation chamber goes Evans! 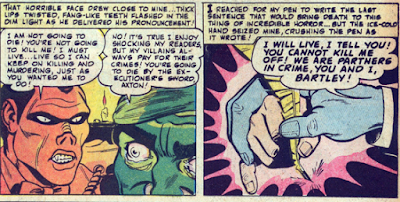 Yes, "Fingers of Fire!" 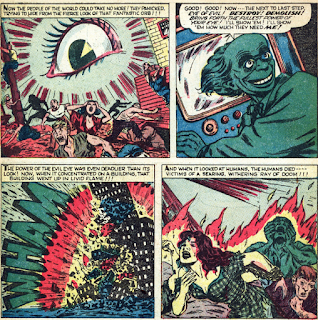 bears a more-than-striking resemblance to the Louis Pollock short story, "Breakdown," published in a 1945 issue of Collier's (and later adapted as a Hitch-directed episode of Alfred Hitchcock Presents), but Evans meets a fiery end while Pollock's character evades death thanks to his tear ducts. Does that make this story worth reading then? Nope; it's just a shameless steal and it's got really really bad art. Two grifters, on the prowl for an easy mark, come upon the house of "The Old Woman." Thinking they can ease their way into the woman's confidence, Hink and Grace rent a room from the old lady, get her to trust them (she confides that her money was made from writing romance books), and then drop the boom on her. They tell her to cut herself off from the outside world and sign her checks over to them from now on. The sweet old thing happily agrees, thinking it all so exciting and a break from her old routine. Her grin and general good mood eventually wear thin for the con artists and they demand to know what's going on. The woman allows that there may just be a fortune stashed in her cellar and, after very little prodding, she leads the way. Once in through the cellar door, Hink and Grace are locked in and told they'll be inspiration for her new trade: writing suspense novels! There's a deliberately vague climax to "the Old Woman" that intrigues me. After telling her prisoners of her plans, the old woman becomes almost ghostly and then the final panel caption reads: Perhaps there are screams still coming from that deserted little White House... perhaps not... over a drawing of a dilapidated cottage, clearly the house shown in the opening but then not quite the same one. So, was the old woman a ghost the entire time? It appears so. 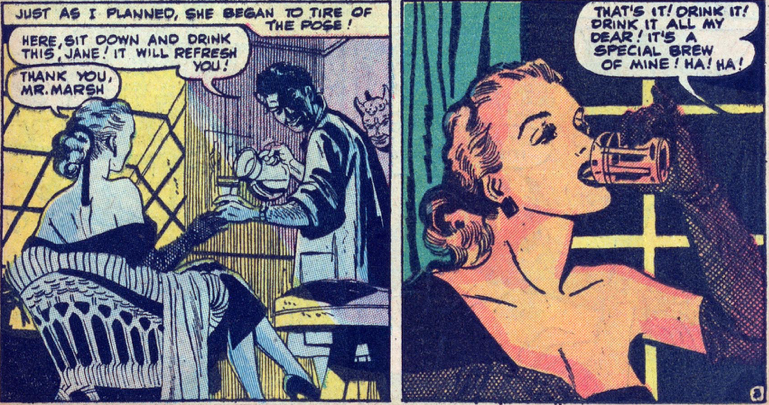 Whatever the case, that final three-panel sequence is supremely creepy, as is most of the story, thanks mostly to Paul Reinman's visuals and a light foot on the gas that allows for the gradual eeriness. Scientists assume that the huge object deep in space which has popped up in their telescopes is a new star but the closer it gets to earth, the more apparent it becomes that it's a giant eye. 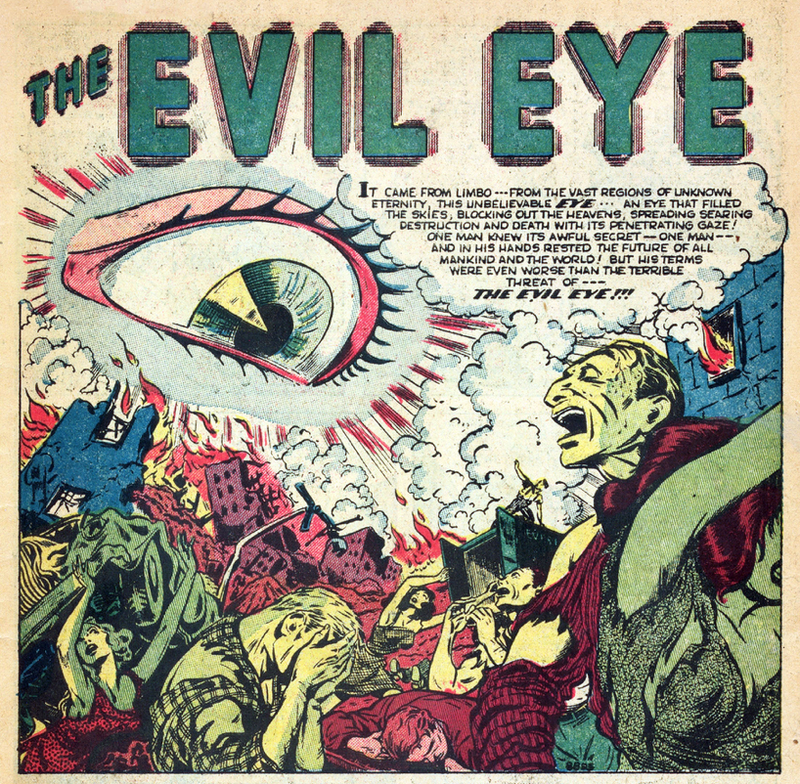 Only one man, Professor Lyle Chambers, knows the secret of "The Evil Eye," but is he mad or is he responsible for bringing this monstrosity into our atmosphere? 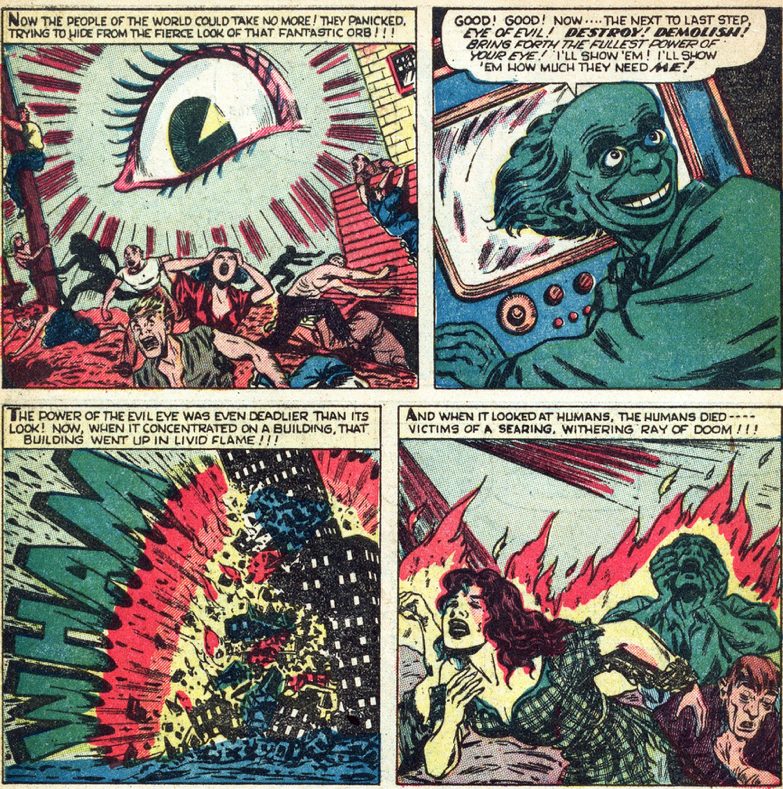 Death, destruction, and wild scientist hair equals everything you could ask for in a 1951 science fiction comic story. 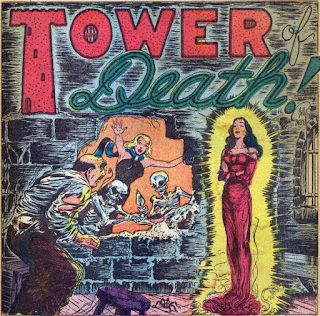 And it's got a nice art job by the legendary Bill Everett to boot. Just about anything Everett worked on was worth... looking at. Ted discovers that his new phone used to belong to the city morgue. Now, when he makes a phone call to someone exactly one year after a death in the city, the person he's calling will drop dead (yes, I know, it's a bit complicated so you can skip this one if you want... I wish I had). Things go great for Ted when he calls his business rival and his rich aunt and both meet with untimely deaths, leaving Ted a boatload of money. But, as these things usually go, Ted makes the wrong phone call at the wrong time and ends up a victim of his own greed. 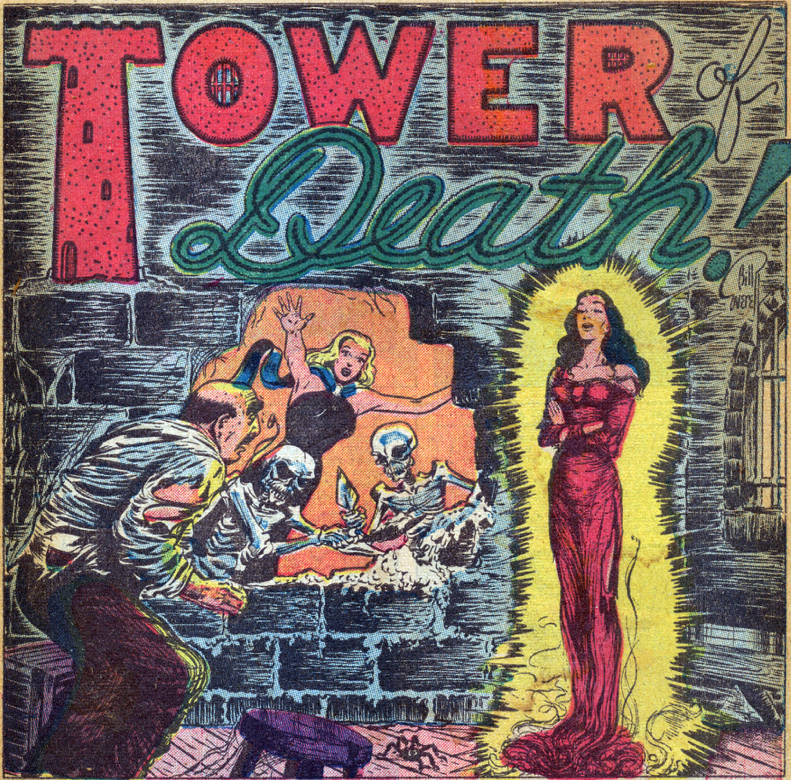 "Dial...City Morgue!" is incredibly silly and unnecessarily complicated with its hook. It's also about three pages too long. Not Pennywise, but "It!" nonetheless! Bill and Jenny Carter have just adopted the sweetest baby and can't wait to get home to spoil him. Once there, though, Jenny becomes increasingly agitated and exhausted, and Bill becomes convinced the baby is to blame. 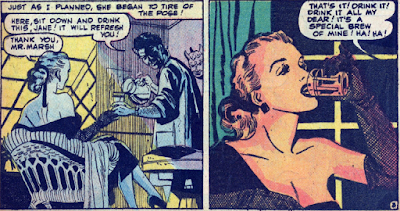 Then he discovers poison in his coffee pot and suspicion swings to his wife. Could she be mentally ill? Jenny takes a bad tumble down the stairs and breaks her neck, leaving Bill to fend for himself and their son. Hearing a noise in his study, Bill opens the door to discover his baby boy holding a gun, pointed at his pop. Just before he pulls the trigger, the child explains that he's actually an alien from outer space and his mission was to kill Bill and Jenny. At Bill's funeral, all the women fawn over the new orphan and wonder who will be lucky enough to adopt the little darling. The humorous climax of "The Man on the Beach!" "It!" explores the fears and angst that every couple face when they become parents, the deep-rooted terror that maybe you're not doing your best... Yeah, right. Well, maybe that was the initial goal of "It!" but the whole thing comes off as so ludicrous, it's tough to consider that the writer may have had loftier goals in mind. 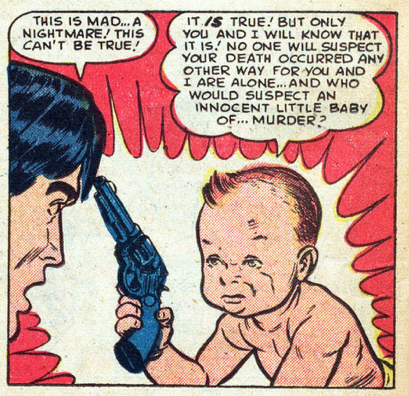 The poor kid is never clothed, spending his entire four-page life in a nappie and nothing else and the sight of him hoisting that gun, looking all the world like a young gangster, is more hilarious than ten issues of Melvin the Monster. But what's the goal of this baby alien? He kills his parents for what purpose? They could have raised him to be the first Damien Thorn just as well as the next couple, right? Clarity is all I ask for. Ray Bradbury spun this first, and much better I hasten to add, with "The Small Assassin" (adapted by Al Feldstein for Shock SuspenStories #7). A young couple come across a disheveled, wild-talking "Man on the Beach," who claims he is the only man who can save Earth from destruction. They invite the gaunt man into their beach tent and hear his fantastic story. Time-traveling scientists, who warn of armageddon and time backwashing, shrink the Earth and then entrust it to our grizzled hero for safe-keeping and send him back to present day. Unfortunately, the scientists didn't do their homework or else they'd know this is the world's most clumsiest man and, sure enough, he manages to lose the world on the beach. The couple scoff at the man's claims until things start disappearing around them. 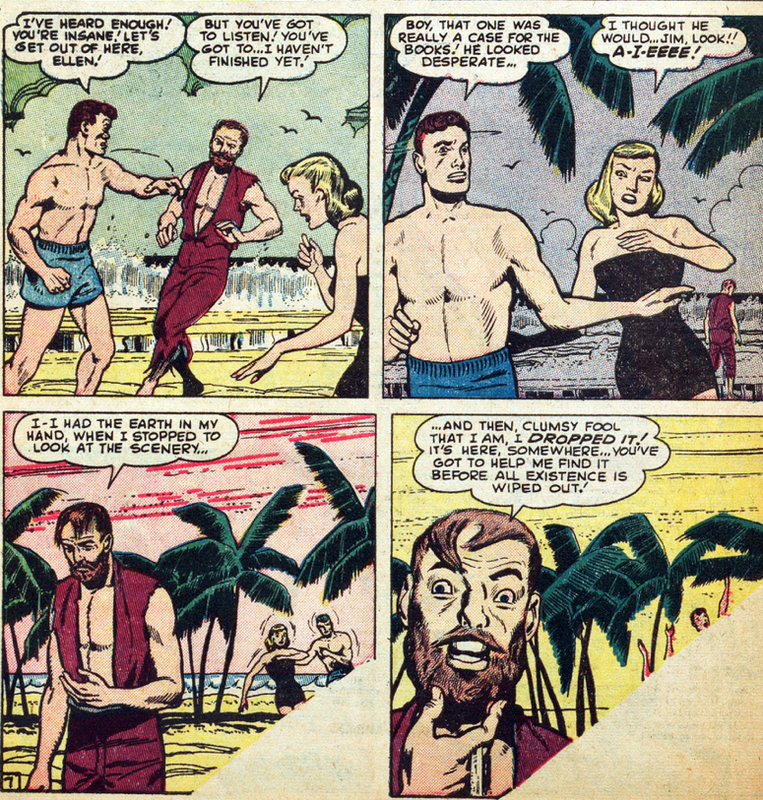 "The Man on the Beach" is so complicated (even for a 1950s Atlas funny book) that it defies description and almost warrants a Tylenol or two. That's not to say it's a bad story (though the LaCava art is tough to sit through),; it's actually quite clever and earns an extra star for breaking the fourth wall in the final panels. I wonder how many kids figured it was a printing error! More from "The Evil Eye!" Herself awake! 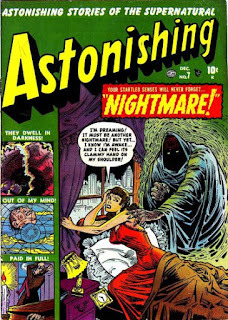 Yep, all just a "Nightmare!" Now Tony tells her to calm down and get ready for the anniversary party that night. But Connie has a sense of doom approaching and can't relax all night. Sure enough, after the party is over, the doorbell rings and it's Rita! The whole scenario repeats itself. Connie screams... herself awake. Yep, we've gotten the "it was only a dream but hang on, was it really cuz it's about to happen again" plot a zillion times but maybe it's because this one happened so early in the game that I can excuse the tired old cliche one more time. And then there's an extra jolt when the murder scene is repeated a second time and Connie's last thought is Am I really awake now... or is this too, a... a... nightmare? That's scary stuff. Nathaniel Hastings begs miser Jeremiah Leech (who holds the note on Nathaniel's farm) to just give him a little more time to pay his mortgage, but Leech tells the poor old man he doesn't care about anything but money and he'll be foreclosing very soon. Nathaniel heads back to his farm in a driving snow and suffers a fatal heart attack. A few nights later, Leech, still smiling about the foreclosure, answers a knock at his door and discovers Nathaniel Hastings on his porch. A bit surprised, Leech asks the old man what he's doing out when he's supposed to be dead and the very pale Nathaniel answers that he can't find peace until he's paid his debt. 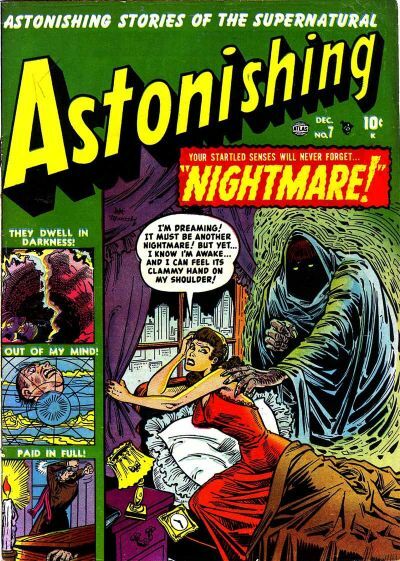 The dead man promises a great fortune if Leech will follow him into the night and Jeremiah, afraid of nothing, agrees. The men end up in Nathaniel's tomb, where Leech finally finds something to be afraid of when he finds he's been locked in. Yet another money-hungry scrooge gets his comeuppance in "Paid in Full." There's nothing new nor interesting about this latest variation although I must admit I thought Harry Lazarus's art very atmospheric in spots. "Out of My Mind" is not a great story but it benefits from some early John Romita work and an early example of the "fiction comes to life" plot line used to great advantage decades later by Stephen King (The Dark Half) and John Carpenter (In the Mouth of Madness). At one point, Bartley's editor tells his writer to tone down the scary stuff since "three people have been driven insane trying to read your books!," another avenue explored by Carpenter. Romita's Axton is not very threatening though with his Zorro eyes, Elvis lip, and Michael Jackson nose. The climax is a letdown but the build-up is a winner. The oddball in this issue's quartet would have to be the final story, "Out of the Darkness," an old-fashioned science fiction story about life 2000 years after World War III. The Earth's surface had become poisoned and man had had to go underground and build a new world but evolution is throwing a funny (but annoying) monkey wrench at the survivors: the children being born in this generation resemble rats and are massing together to murder their human parents. It's up to scientist/super-stud Carleton Lar to invent a contraption that will clear up the poisons and allow man to walk the Earth again. Preliminary scouts discover a freakish form of dinosaur has evolved up top and the creatures must be destroyed if civilization is to "move upstairs." Luckily, Carleton's machine kills two dinosaurs with one stone; when the poison clouds disappear, the monsters die! Not sure who thought this would be a good fit amidst three horror stories, but "Out of the Darkness" is imaginative and enjoyable for both its wild scenario and its Joe Maneely artwork. 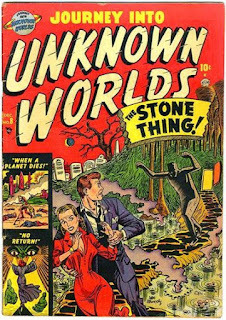 It's funny to think of this as a throwback story since it was published 66 years ago but it has the feel of a 1940s SF adventure. I assume the radiation is to blame for the full-grown dinosaurs our heroes have to face. 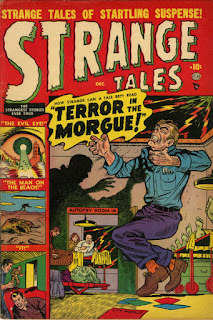 I didn't feel that enough issues were published from 1949 and 1950 to warrant a Ten Best list but the end of 1951 seems a good place to start a yearly Best of. So far we've covered 247 stories from 65 issues and the quality is surprisingly high. Of those 247 stories, 34 received a rating of three stars or higher (out of four), with two receiving the full four stars. Could '52 be even more grim than '51? 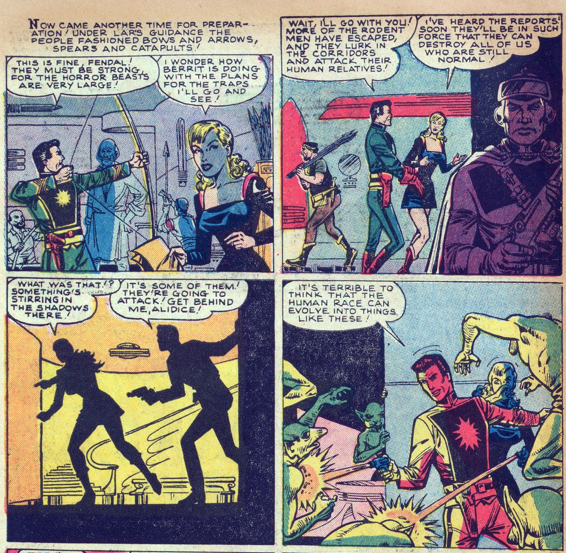 I've heard that Patricia Highsmith did some comics for Marvel in the pre-code days, have you come across any of her work yet? 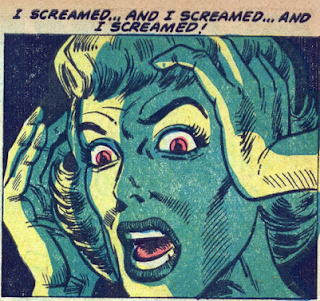 I checked the Grand Comics Database and the last thing it lists as by her is in 1946. None of the stories were for Marvel.